Food & Cooking | My Thinking Out Loud! Food & Cooking – My Thinking Out Loud! Food watchers & Singapore Food lovers would no doubt know by now that Gordan Ramsay only won 1 out of 3 food challenges, namely Chilli Crab. He lost the Chicken Rice & Laksa challenges. What interests me were the results. Gordan Ramsay was given 1 day to learn to make these 3 dishes. Yet the margins were narrower than I expected for 2 of the challenges. From my experience, it takes time to master a dish + endless trials and errors to compensate for the difference in the taste of ingredients. Gordan Ramsay probably never used our herbs & spices so it’ll take some time to understand how they affect the chemistry of the food & other spices they’re paired with. Yet, he managed such a small margin of lost for Chicken Rice. I think it boiled down to the Chilli because it probably doesn’t take much to master the poultry for a master chef like Ramsay. The rice is quite straight forward actually. The biggest margin of lost was in the Laksa challenge which isn’t surprising because Nonya/Peranakan food are notoriously labourious to make & difficult to master. The Laksa paste is probably the biggest headache for him. The mix of herbs & spices + processing the dried shrimps must be very precise. So it’s no surprise the margin of lost was 19%. Given more time (maybe 1 week), I’m pretty sure Ramsay will win the Chicken Rice challenge. In this challenge, the winners are actually the losers. Mr Ang of Jumbo Seafood just need to adjust his recipe a little (or a lot) depending on how different the 2 challengers tasted. Ramsay obviously have a newfound respect for Singapore food now & who knows where that’ll lead. I love food! I REALLY REALLY LOVE FOOD! So what’s better than finding a great place to sample great food? Finding great recipes & cook it myself! I love to create stuff for others to enjoy, which is why I was a programmer & now a blogger. Cooking is just another way for me to express my creativity. Unfortunately, I have no formal training & my experiences have always been trial & error. After a few tries, I do eventually gets it & make the recipe my own. I make a pretty good Cheesecake & I can do a restaurant style scrambled egg with runny center & caramelized skin. However, these are based on others’ recipes which I’ve perfected by tweaking. Which is why I find Heston Blumenthal’s way of cooking so fascinating! 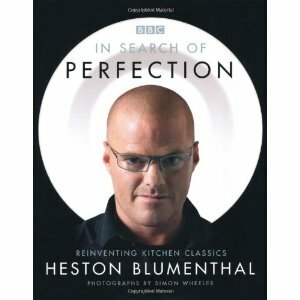 If you don’t know Heston Blumenthal, I don’t blame you. Unlike Jamie Oliver & Anthony Bourdain, Heston don’t do TV much until recently. However, his restaurant, “The Fat Duck”, has 3 Michelin-stars & has been voted “Best Restaurant in UK” many times. I chanced upon Heston Blumenthal in 2009 after trying the Ramen @ Ippudo Mandarin Singapore. My wife & I were exploring the new Mandarin Gallery (shopping center) when we come across an open-concept café with an interesting menu & concept. It was a café that sells exotic ingredients, cookbooks & many of their dishes uses these exotic ingredients. I don’t remember having anything there but I came upon this book called, “In Search of Perfection”. Inside the book were crazy recipes that uses crazy equipment that process crazy ingredients that were next to impossible to recreate with my average home utensils. I managed to watch the TV series that the book was based on & while inspiring, reinforced the idea that I can’t attempt these creations without putting serious time & money. It was very educational & entertaining though because Heston’s idea of cooking is based on Science & not myths. He prefers to experiment to remove any guesswork from his recipes. This inspired me to enhance some of my current recipes & try new techniques. Recently, while searching for Heston on Youtube, I came across a new BBC series called “How to Cook like Heston” which was aired in 2012. These recipes were much more approachable, uses simpler ingredients which are easier to source (dry ice versus liquid nitrogen) & uses every day kitchen utensils + a thermometer. This motivated me to try something that’s really nice that most restaurant got it wrong. The Process & using local ingredients. Living in a HDB apartment in Singapore where space is limited, I’ve made some changes to the recipe to allow for tighter space. For home-cooks, you need to buy an oven thermometer (your oven thermostat isn’t accurate enough,) a meat thermometer & plenty of cheap coarse salt. 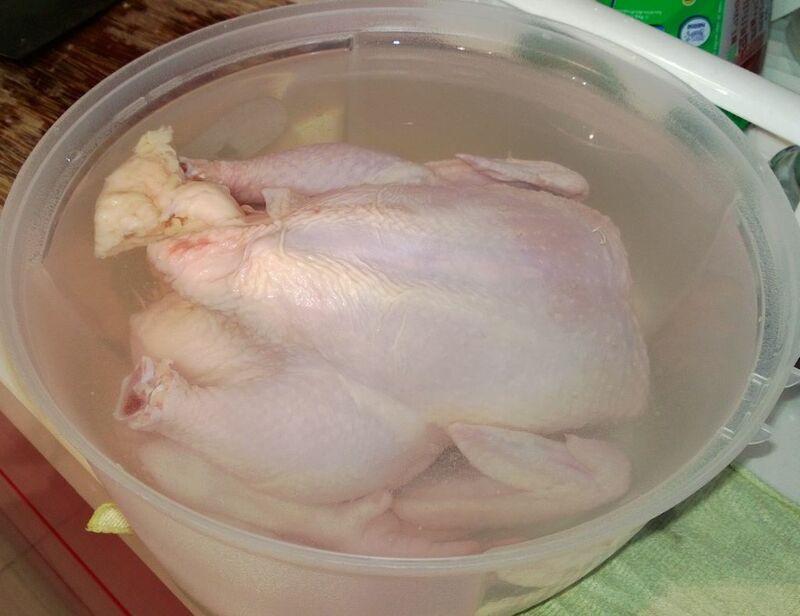 The washing bowl is replaced with salad spinner bowl (or any bowl that’s deep enough) & the UK chicken is replace with whole Kampong Chicken. Other than these changes, Heston’s recipe should be fool-proof enough for anyone who’s had some experience in the kitchen. For novice or noob, try something simpler (like Heston’s foolproof scrambled egg) because this recipe takes almost 4 hours to complete excluding the brining process (19 hours including) & you need to process the whole chicken (chopping off & ridding internals.) It can be devastating to spend so much time to fail. The result was fantastic! 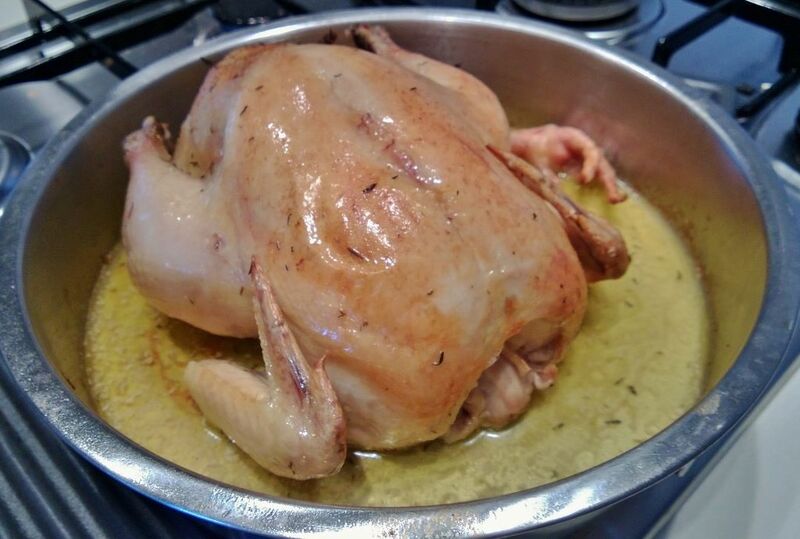 The best roast chicken I’ve ever tasted! Move aside Kenny Rogers! Brining the Chicken in 6% salt solution, making sure the whole chicken is covered. 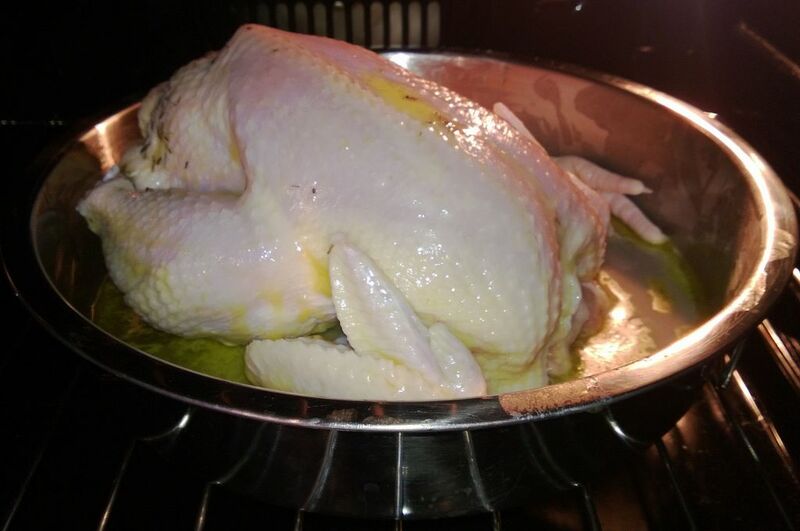 After buttering the chicken, it’s ready for slow bake. 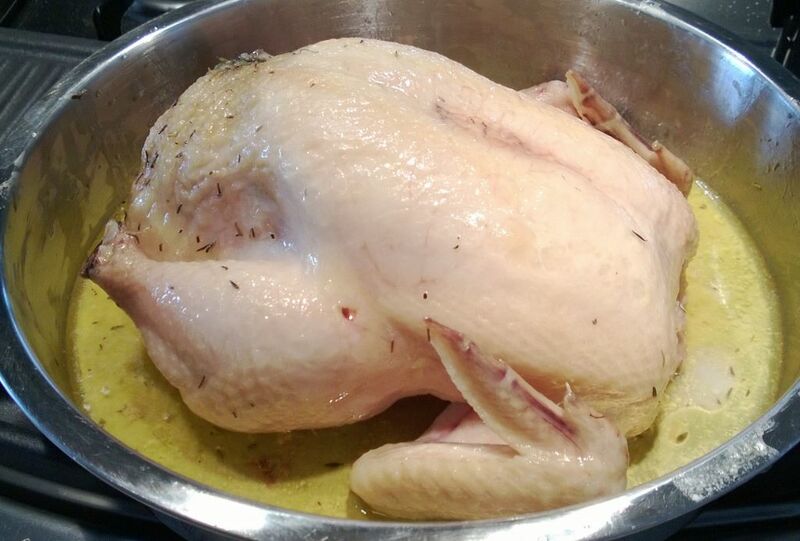 After slow bake, the skin should look raw. After a quick blast of hot air, the skin will separate from the flesh & brown. The process continue because I’ve saved the carcass for the next part, Chicken Stock, which requires milk powder & pressure cooker. I’d post that next time!